Ecclesiastes 3 says so nicely that : there is a time for everything, and a season for every activity under the heavens – a time to be born and a time to die, a time to plant and a time to uproot, a time to kill and a time to heal, a time to tear down and a time to build, a time to weep and a time to laugh, a time to mourn and a time to dance, a time to scatter stones and a time to gather them, a time to embrace and a time to refrain from embracing, a time to search and a time to give up, a time to keep and a time to throw away, a time to tear and a time to mend, a time to be silent and a time to speak, a time to love and a time to hate, a time for war and a time for peace…..and the list can continue! In closing he says that: Whatever is has already been, and what will be has been before; and God will call the past to account. This past month I experience a lot in Smiles! The world that we live in combined with the work we do is not getting any easier at all. I’m really blessed to have so many people around the world that are praying, supporting and giving their time in order to help us! Be blessed because you are a blessing for sure! 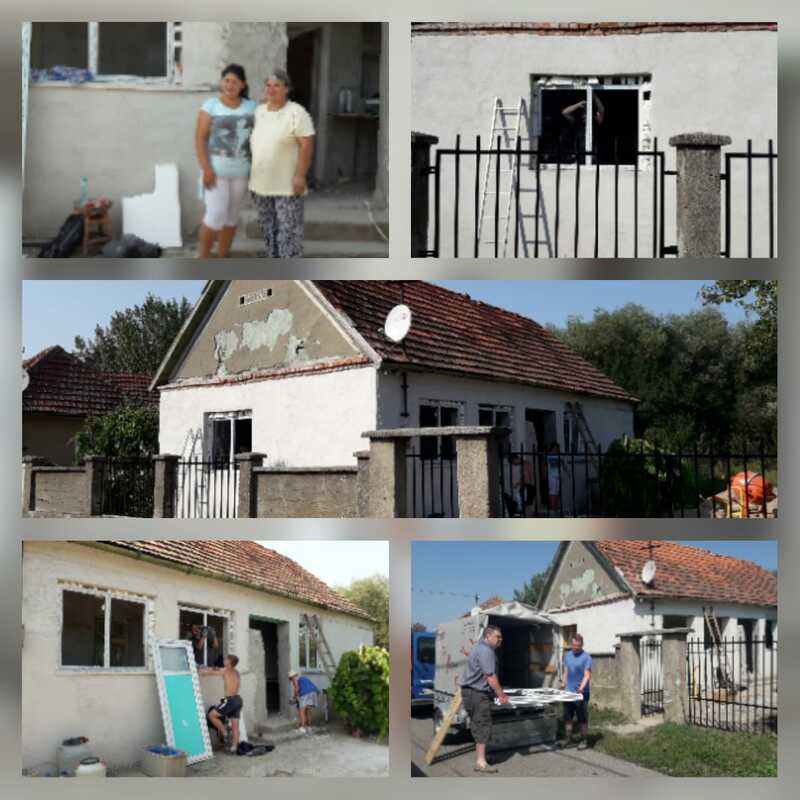 August was a busy month with the mission trip visits to Smiles Romania. It started with a team from USA that I also told you about in my July update. For two weeks we had psychologists who each day went out on the projects spending their time talking with people. For a few days I was involved in it as well, and I really loved it! I have many nice memories and some that I will never forget. The day that we went to visit a young mum who wanted to kill herself because she is feeling really lonely even though she has a great child; the day when we visited a family who had just received the sad news of a dear one who had passed away…….and the days that I had to spend time with the kids in our projects! As soon as they left, another two teams arrived…this time from the UK! I loved the time I spent with them too. 4 days this past month we organised what we call ‘kindness days’ . 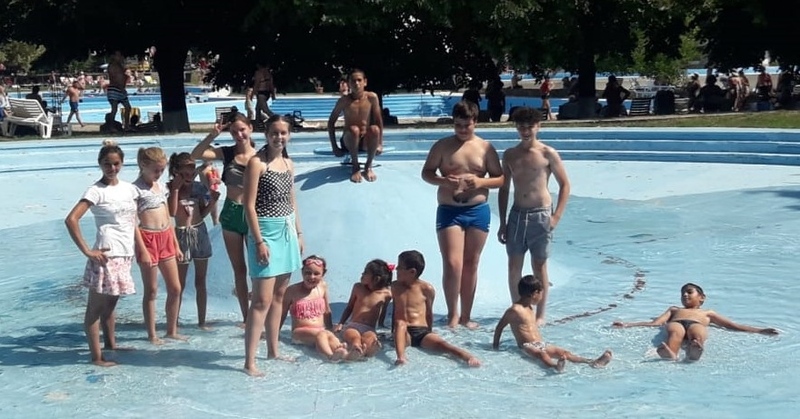 So for 4 days we took children from our projects and spent the day at the pool in Baile Felix. Yes – you’ve heard me correct!!! Kids at the pool!!! It was great fun for them and for the trippers! Nearly 60 kids from Tileagd and Rapa, Field project benefited from this treat! I want to say a huge thank you to everybody that helped me to make this dream a realty! Also during August month, the team that works at the Mission Centre non-stop, Mr Hoy, Luke, Chloe had 3 days off!! A really well deserved break. 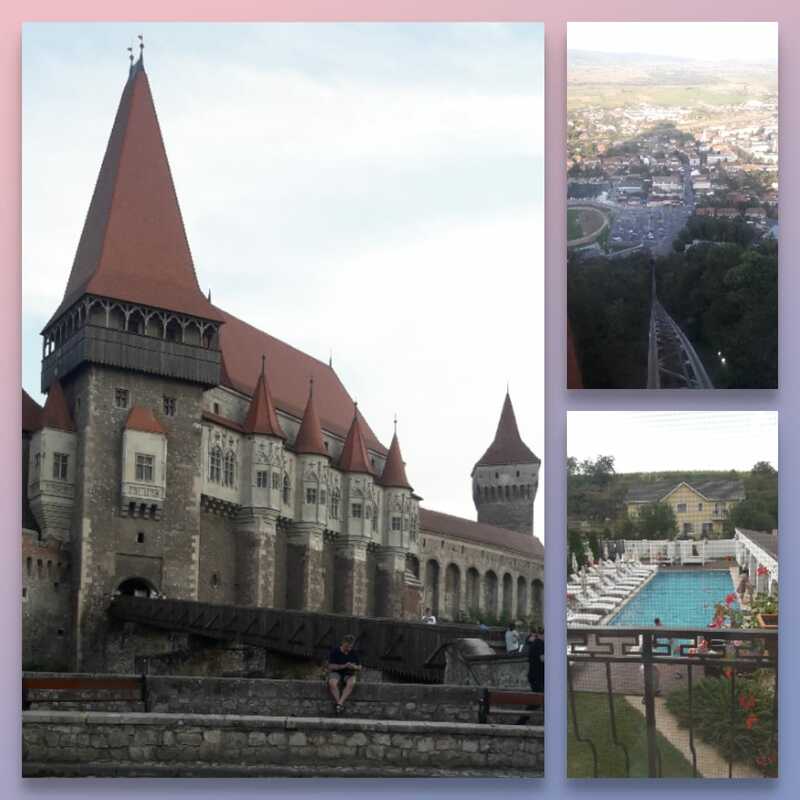 In order to make it even nicer, I took them to visit a few places around Romania! If I have not told you before now, but I think I’ve mentioned it a few times, we have a really beautiful country!! This time I took them to visit the Fortress in Deva and the Castle Corvinilor in Hunedoara!! As soon as the 3 days finished, we came back to base ready for our last team this summer! A team from Worthing, in the south of England. They were full of energy, and they spent their week changing the world for several families here in Romania. I could share a lot from the locations, but the one that I have been directly involved in, was the Coman family. I have told you we moved them to one of our houses in February, when we restructured the Homeless project and the container village. They’ve settled in the house, and in the village really well. If for the last 10 years I’ve heard from the neighbours how bad the family was we had staying in the house, this past week I’ve heard only positive words about the Coman family! In July when I visited them, soon after Barbara’s death, I asked them what was their need! And Lady Mariana told me that her dream was to have a new window and a door in order for the winter time to be safe and warm!!! I did not have a clue how to help her as UPVC windows cost a lot of money, more than my “ emergency budget” is! So I left it aside! Well….the same week I had a bad experience with another family that I’ve told you in my recent reports, the Colar family! I’ve told you that Smiles sold one of the properties in Tulca to the Colar family! If until the day they became the “owner of the house” the relationships between us was ok, once their name was on the paper, things changed. So much so, they did not want us to visit them or give permission to do work on the house (to help them). AND HE DID!!! Mrs Coman has new DOOR and new WINDOWS. And not 1 BUT 4!!! I think that these days more and more of that is so true in Smiles work! So many changes that I thought would be the end is actually showing a new fresh start! But that’s only BECAUSE OF GOD and His faithfulness to us! I heard some people criticise us this year that “Smiles is not a charity, it is a business” or that “Smiles care about the projects more than the people”. Thankfully, GOD KNOWS THAT SIDE TOO. I’m happy and thankful that I have the privilege to work in Smiles and serve the people of my country! Of course, Smiles has become so big there are many ‘business’ aspects that must be considered. Because such things were not considered in the past by other charities, many no longer exist. I have come to believe and understand that for Organisations to be run effectively, professionally and in a Godly manner, they must have sound business procedures and then the work can be truly honouring to God. As for the bad comments! Yes, it is hurting when I hear them, but “there is a time for everything and whatever is has already been, and what will be has been before; and God will call the past to account.” What I do different now? I tell you honestly and straight the situation, about everything and everybody, not to cover it up and pretend that everything is perfect! I’m committed to tell the truth because God demands that from us. Just as I have now! Be blessed and thank you for reading my report this month too and not giving up on us! Your reward is in heaven!